A separated style room dotted around Ogawa.Ten Japanese rooms are equipped with private hot springs. Because there are two rooms, you can relax. 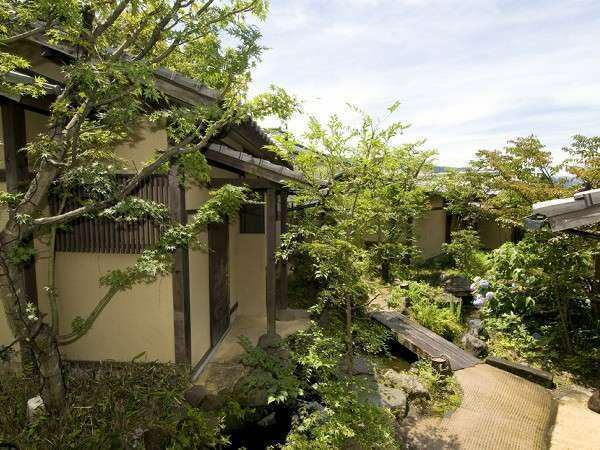 Feel the wind of Yufuin, a garden resting place.The appearance of an old private house dotted with the main building, the rooms and streams as the center is reminiscent of the good old days. We offer private hot springs in all rooms.Inner bath or semi open-air bath treated with cypress. ·As room wear, we offer two kinds of yukata and work clothes.·In addition to ordinary dryers, Kurukuru dryer is also prepared in the room.